As WLAN capacity requirements soar, the AP250 and AP245X are excellent choices to provide instant adaption to ever-changing capacity needs. New high-performance mobile devices and demanding applications continue to change how connected enterprises do business. With a constantly changing client landscape and new Internet of Things (IoT) devices on the horizon, enterprises are challenged to have network infrastructure for the clients and devices of today while anticipating the connectivity needs of the future. To address escalating connectivity demands today, Aerohive introduced the AP250 and the AP245X, two new cloud-managed 802.11ac Wave 2 access points that are the first to deliver enterprise-class capabilities and uncompromised wireless functionality while operating on existing standard wired infrastructure of 802.3af Power over Ethernet (PoE). The access points also feature integrated Bluetooth Low Energy (BLE). Both the AP250 and the AP245X are built on Aerohive’s proven RF-IQ technology to deliver great Wi-Fi. RF-IQ incorporates distributed control radio intelligence, such as automated channel and power selection, load balancing, band steering, and other capabilities that enable complex radio functionality. The AP250 is the only Wave 2 and BLE solution that can operate in dual 5GHz mode with uncompromised performance for increased capacity, without PoE switch upgrades. 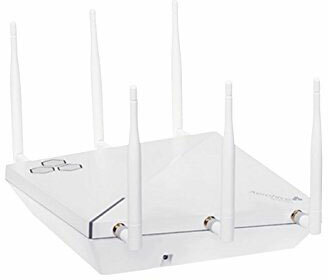 Aerohive’s patent-pending RF-IQ antenna and the first-of-its-kind network technology provide polarization and spatial diversity which ensures performance even in dual 5GHz mode, delivering uncompromised performance under 802.3af power budget. The AP245X delivers Wave 2 with external antennas and a rugged design for challenging environments, such as warehouses, manufacturing floors, and extreme temperature environments. Both the AP250 and the AP245X access points feature integrated BLE and a USB port to enhance location-driven services and provide additional wireless connectivity options for IoT and other devices.